Whole Tomato has always taken pride in maintaining support for every Microsoft IDE our customers use, from Visual C++ 6.0 through Visual Studio 2013. If you own a license for Visual Assist, or are considering a trial, know that the latest build of Visual Assist has full support for Visual Studio 2013 RTM. Users with software maintenance through November 11, 2013, qualify to run Visual Assist build 2007, which supports Visual Studio 2013 RTM. 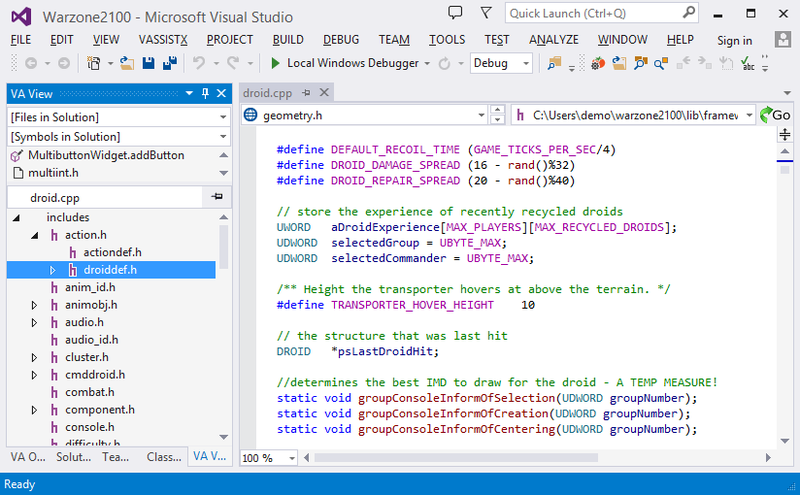 (Older builds of Visual Assist have supported the RC and Preview editions of Visual Studio 2013 since June.) Check the System Info node of the options dialog of Visual Assist if you aren’t sure if you qualify, and renew maintenance if necessary. With only two of the 60+ features in Visual Assist incorporated into Visual Studio 2013, Visual Assist remains a powerful and necessary add-in to Visual Studio. The two features incorporated in the latest IDE—toggling between header and source files, and automatic inserting of closing braces and parentheses—have been part of Visual Assist since 1999. Developers at the Tomato are impressed these two small features have contributed to productivity inside the IDE for 14 years, and as long as customers write and maintain code in multiple Microsoft IDEs, will continue for at least another decade.